Game Time | Editor's Note | Kids VT - small people, big ideas! As a kid, I spent as much time as I could playing video games. In the early '80s, before we had a computer at home — remember those days? — I'd play wherever I found a machine: in restaurants, bowling alleys, arcades. When I was 11, my parents bought the family a Commodore 64. We put it in the basement, which was the perfect refuge during hot summer afternoons. My sister and I would spend hours down there playing Lords of Conquest and M.U.L.E. So I was thrilled when I had the opportunity to help create a video game this spring in conjunction with "Connecting the Drops," a public art project organized by the Let It Rain stormwater program. Connecting the Drops educates Vermonters about the problem of stormwater runoff, the dirty water that flows into the lake when it rains. The project commissioned local artists to decorate rain barrels, which catch rain and keep it from becoming runoff. The resulting art installation, on display through August, stretches from the top of Burlington's Church Street down College Street to the ECHO Lake Aquarium and Science Center, which is hosting a related exhibit. Kids VT contributed an illustrated story walk to the project, educating readers about stormwater runoff; we wrote about it in the May issue. While we were creating the story walk, we realized that the concepts it described would translate well to a video game. So Kids VT and our parent company, Seven Days, hired a local studio — Birnam Wood Games — to design a fun, simple, kid-friendly video game about rain barrels and stormwater management. A couple of weeks later, Birnam Wood brought us Runoff. It looks like the classic arcade games I remember, but instead of blowing up starships, players have 90 seconds to catch raindrops in a barrel. Birnam Wood suggested making it into a real arcade game. We got an old Tempest cabinet from Matt Strauss of Williston's Subatomic Digital; the engineers at Logic Supply, in South Burlington, helped us update it. You can play the arcade version at ECHO, or download the game to your Apple mobile device from the Seven Days app store. You can also play it on the family computer at playrunoff.com. It's fun, and after you're done, you'll know what a rain barrel does and where to get one. My kids love it. 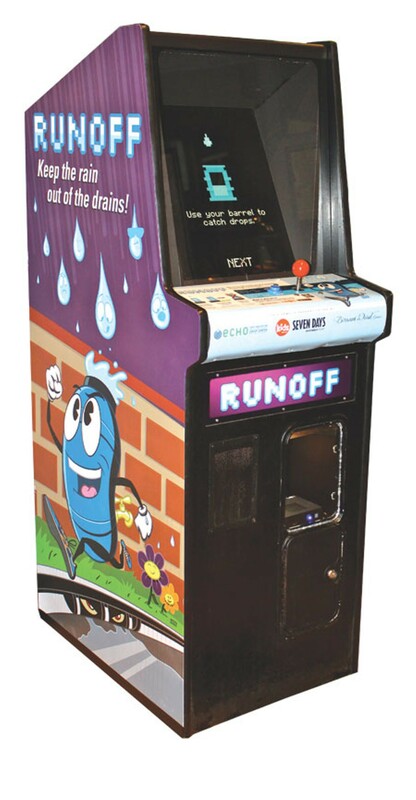 Unlike old-school arcade games, there's no charge to play Runoff. But we'll donate a quarter to the Let It Rain stormwater program for the first 1000 people who play. That money will help Let It Rain provide financial incentives to property owners who install rain barrels. Yep, you can actually help keep the lake clean by playing this video game. Of course, you could also be out enjoying the water. This issue of Kids VT is packed with stories about outdoor summer fun. In "Fit Families" (page 11), writer Sarah Tuff explains the stand-up paddleboarding craze and how kids can be incorporated; in "Out to Eat" (page 15), Cindy Morgan and her family check out Burger Night at Bread & Butter Farm. The award-winning Kids VT "Vermont Day-cations" series (page 18) continues with two more writer-tested recommendations: the Lake Champlain Maritime Museum and the ArborTrek Treetop Obstacle Course at Smugglers' Notch. After an active day, you might be craving an ice cream cone. Our staff and their kids reviewed some of the state's newest indie ice cream brands in "Beyond Ben & Jerry's" on page 22. However you spend your summer vacation, drop us a line and let us know. We love hearing from you. P.S. Join us for a Vermont Lake Monsters game at Centenniel Field on July 18 for Kids VT night at the ballpark! See page 39 for details.